OK, there are certain foods that I just can't stand. I hate Lima beans; I hate chickpeas; I detest eggplant. There are other foods that I'm indifferent to, like tofu, turnips and celery. I don't hate these foods as much as I see them as little more than culinary Styrofoam - i.e., filler. So I understand why people hate certain foods. I usually agree with most people on the what belongs on the "do not serve" list. There is one notable exception. I love beets. Stop! Wait! Don't run away! Beats me why people are so violently anti-beet. At least with Lima beans and chickpeas there's a valid reason to hate them: they taste awful. Those things are mealy and bitter, beets are used to make sugar. Beets are sweet. Beets stain your hands and change the color of your digestion. Beets are neat. All I can think of is that most people have only ever tried pickled beets. Yes, it's true, pickled beets are vile. 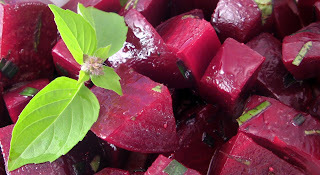 But roast beets are spectacular, especially when served with a tart counterpoint. So, for you adventurous eaters out there, for you intrepid souls willing to face your fears, here is a recipe for roast beets. This side dish works with grilled meats, or the Sunday Roast Beast. It's simple and can be prepared while you're working on the rest of dinner. Try it, who knows, you just might enjoy change your mind. Place the peeled whole beets on a large sheet of aluminum foil. Drizzle 1 TBSP of olive oil over the beets, mix to cover. Close the sides of the foil, forming a sealed pouch. Place the pouch on a cooking sheet. Roast the beets until tender, approximately 45 to 60 minutes. 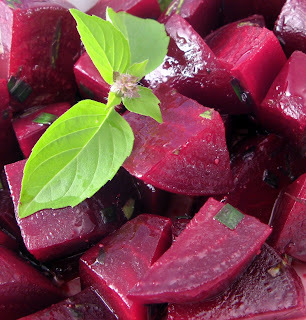 While the beets are roasting, put the olive oil, lemon juice and mint in a small bowl and whisk to combine. Salt and pepper to taste. When the beets are done, remove from the oven and carefully open the pouch to allow the beets to cool. Cut the beets into 1" - 2" chunks. Place the chopped beets in a bowl. Pour the olive oil lemon juice dressing over the beets and serve. That's it. Simple, easy and a nice combination of sweet and tart. It's a dish that works exceptionally well on a fall evening. Another serving option is to add small chunks of goat cheese to the presentation. The zing of the cheese offsets the sweetness on the vegetables perfectly. Well, that's it for today. Maybe one day I'll try a Lima bean recipe, (I'd advise against holding your breath waiting for that one). As always, remember, you can do it, you can cook. Hi Crabby. This is my first time on your site, and I'm going to do a couple of your recipes tonight. Beets...my family LOVES them. My 5-year-old has been eating them since she could walk, turning her...uh...toilet deposits florescent red! A tip on peeling beets: if you put wrap the beets and cook them with their skins on, the peel just slips right off. Then ready for dressing. I've only wrapped them in foil individually, but will try it all together. I love beets too! Roasted, pickled, boiled I don't care. I was just at a market here in Vancouver that had red, white and a golden color beet. I thought they would make a beautiful salad. I used to hate beets because of the gross tasting canned sliced beets they used to serve in the school cafeteria for lunch, and at buffets. But done right as you have here, beets can be fantastic. Thanks for the beet recipe, they were yummy! I kept eyeing beets all summer at the local farmer's mkt, but really didn't know what to do with them... I made them tonight with the original roast chicken recipe and got two thumbs up from Klondike. I am making slow but sure progress and am now practicing reciting "I...can...cook!" Keep 'em coming. I am a beetaholic. Even the canned pickled ones. The flavor of roasted beets is a taste I find in the finest of French Burgundies. Fresh roasted beets, goat's cheese and a bottle of Burgundy make my knees knock. Will be trying a 2002 Volnay with your dish. Beef Stroganoff; Toga! Toga! Toga! Carrot Cake in a Time of Downsizing.